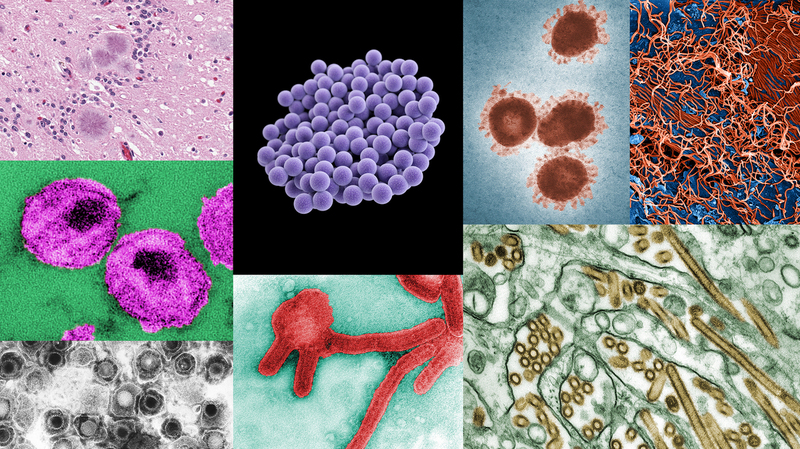 Which Contagious Diseases Are The Deadliest? : Goats and Soda To put Ebola in context, we tried to find a list of the deadliest contagious diseases. We couldn't. So with the help of scientists and health agencies, we came up with a rundown of the world's worst. No one knows what the death toll in the Ebola epidemic will be. As of Tuesday, nearly 2,500 people have died and nearly 5,000 have caught the virus, the World Health Organization says. So how does this epidemic compare with the toll taken by other contagious diseases? Comparing fatality rates could help put the current Ebola outbreak in perspective. Trouble is, getting an accurate value for many diseases can be hard, especially in places where the health care infrastructure is weak. Take the situation in West Africa right now. "We can only count those who come to the doctor, not those who stayed home and got well, or those who stayed home and died," says Carol Sulis, an epidemiologist at Boston University School of Medicine and the Boston Medical Center. Another issue is that "deadliest" can mean two things. It can refer to the fatality rate — the number of deaths per number of cases — or it can mean the number of deaths in total caused by a disease. What's more, diseases can take a different toll in different parts of the world. In low- and middle-income countries, only limited medical care may be available, if that. This will raise the fatality rate for many infectious diseases, such as tuberculosis, malaria and infectious diarrhea. "Similar to Ebola, people's chances of survival increase for most of these [contagious] diseases, some dramatically, if people receive medical treatment," says epidemiologist Derek Cummings, at the Johns Hopkins Bloomberg School of Public Health. Even if lists have their limitations, they can shed light. We spoke to Cummings and Sulis and consulted data from the World Health Organization and the U.S. Centers for Disease Control and Prevention to come up with two lists: the deadliest contagious diseases by death toll and by death rate if untreated. Data are for all fatalities in 2012, except for infectious diarrhea and pneumonia. For those, death tolls represent a yearly estimate and represent childhood victims only. Comparison point: As of Sept. 7, the number of reported deaths in the current Ebola epidemic is 2,218. Even though HIV takes a tremendous toll each year, the population of people living with the disease is about 35 million. Since antiretroviral therapy — ART — became available in the mid-1990s, life expectancy for someone infected with HIV has dramatically increased. Today, a person who is promptly diagnosed with HIV and treated can look forward to a close-to-normal life span. But as with other diseases, Sulas says, "we have to have the infrastructure to find the cases and be able to afford the medicine and deliver it to those affected." Despite the death toll for this airborne disease, there is encouraging news: 7.3 million people developed TB and survived in 2012. Recovery requires a regimen of several drugs over a six- to nine-month period. Patients who don't follow the drug schedule can develop drug-resistant TB. Drug-resistant forms of TB are also airborne. For those patients, treatment can extend to two years. It's the world's leading killer of children, "more than AIDS, malaria and tuberculosis combined," WHO says. The risks are also high for the elderly and those with other underlying conditions. In rich countries, like the U.S., vaccines can prevent the disease, but that is not the case in much of the world. "That's an enormous waste," Sulis says. The majority of cases (about 1.7 billion globally each year) could be prevented and treated with better hygiene and sanitation, along with access to clean food and water. "There are many pathogens" that can cause these infections, she says, "but the whole class of diseases categorized as infectious diarrhea is deadly." The world records about 200 million malaria cases each year. According to WHO, "most deaths occur among children living in Africa where a child dies every minute from malaria." There's a growing worry for both malaria and TB, Sulis says, because "the organisms that cause those diseases are becoming increasingly drug resistant throughout the world." Here, as in the list above, fatality rates can be lowered significantly depending on the presence of sanitary conditions and the availability of medical care and vaccines. We present the diseases that appear to have the highest fatality rates if not treated. If the rate is a range, we ranked the disease by the highest possible fatality rate. Comparison Point: Outbreaks of Ebola can have fatality rates up to 90 percent, WHO says. But in the current outbreak, it's about 50 to 60 percent. Rabies is nearly 100 percent fatal if not treated. There are approximately 55,000 deaths each year, primarily in Asia and Africa. Doses of the rabies vaccine after a bite from an infected animal will essentially abort the disease. But a person must receive treatment immediately. Initial symptoms include discomfort where the bite occurred, anxiety and agitation. Once clinical signs such as delirium and hallucinations arise, the patient almost always succumbs. Creutzfeldt-Jakob disease is apparently 100 percent fatal. This neurodegenerative disease rapidly progresses. It is caused by prions (nonviral, nonbacterial infectious agents that consist of a misfolded protein) that damage healthy brain tissue. Prions create holes in the brain that make it look like a sponge under the microscope. CJD is classified as a contagious disease because it can be transmitted through contact with contaminated tissue during medical procedures. But it's not spread through the air or by casual contact. No treatment exists for CJD. Its incidence is very low, affecting about 1 in 1 million people each year, with about 300 cases annually in the U.S. CJD can be difficult to diagnose because symptoms often resemble those of dementia and other diseases, with memory lapses, behavioral changes and sleep disturbances. Marburg is caused by a virus similar to Ebola, transmitted mainly by contact with bodily fluids from someone who's been infected. Fever, chills, headache and muscle pain are the first symptoms, showing up within five to 10 days after infection. The next stage can cause vomiting, diarrhea, delirium and organ dysfunction or failure. There's no known treatment beyond supportive hospital therapy. Since 1967, when Marburg was first recognized by scientists, there have been 571 reported cases. These two viruses "remain two of the influenza viruses with pandemic potential," WHO says. They're in wide circulation among some groups of poultry; humans do not appear to have any immunity. The total number of human cases for both viruses so far is about 1,000. Some antiviral treatments and vaccines are available. First detected in 2012, this illness can lead to coughing, shortness of breath, fever and pneumonia. When patients die, the cause may be a lack of oxygen passing from the lungs into the blood. Scientists theorize that MERS could have first appeared in bats, which passed it to Arabian camels, which may then have infected humans. The majority of the 800 cases have been on the Arabian Peninsula.